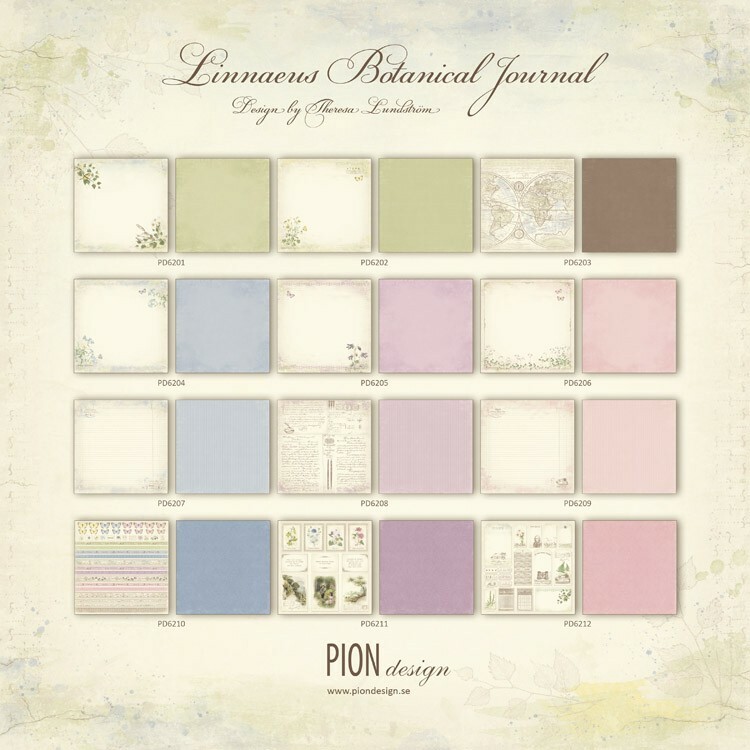 Linnaeus Botanical Journal ~ Release! We are glad to let you know that our new paper collection Linnaeus Botanical Journal has now been released and shipment has started. We hope that you will be able to find these inspiring papers in a store nearby within shortly! Pion Design invites you on a flourishing journey in the footsteps of Carl Linnaeus, the Swedish botanist famous for collecting and identifying plants and flowers particulary in the north of Sweden. The paper collection Linnaeus Botanical Journal is inspired by notes and drawings made by Linnaeus in the early 1700’s and has captured a sense of wonder at the world of all living things. Traditional flowers such as Buttercups and Daisies accompanied by vintage maps and delicate butterflies are certain to unfold the calmness of nature and offer you endless of crafting inspiration. So welcome to make the botanical theme one of the necessities for this season’s crafting occasions! Linnaeus Botanical Journal consists of 12 double sided papers in the size 12×12″ as well as 6 single sided papers in 12×12″ with 4 designs in 6×6″. The collection is also available within the collection Memory Notes, for fast and easy journaling in an instant.